Headingley Hill Congregational Church on Headingley Lane. . Picture Tony Johnson. 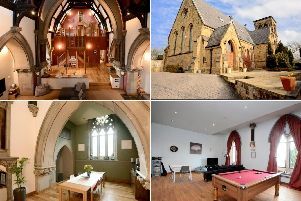 A developer hopes his plans to turn a 150-year-old former Headingley church into flats will help preserve the work of renowned Leeds architect Cuthbert Brodrick. Yusef Iqbal, of Imperius Rex, has submitted plans to turn the now derelict Headingley Hill Congregational Church, on Headingley Lane, into eight flats. The church was designed by Cuthbert Brodrick - who was responsible for some of the most notable buildings in Leeds of the mid-19th century, including Leeds Corn Exchange and Leeds Town Hall. Despite his major civic work, some of his smaller projects - such as the Congregational Church - are not well-known. Yusef, 22, is embarking on this development as his first project after graduating in architecture from Leeds Beckett. He said the flats will be a mix of one-bed to three bed and aimed at young professionals and small families. “It’s a beautiful building that’s been empty for a year now. It’s quite integral to Leeds’ history, being a Cuthbert Brodrick building,” he said. The Congregational Church moved out in 1978 and after a brief use as offices, the building returned a place of worship by City Church Leeds in 1996 but was later sold due to falling congregations. The exterior will not be altered under the plans but inside, four lightweight ‘pods’, built around columns, would create flats yet leave a clear view of the ceiling in the main hall. The planning application is a re-submission of an earlier application which was approved subject to conditions.